We already have quite positive experience with 2Checkout so we decided to integrate it in Invoicebus. Available in 197 countries, with 26 currencies supported, 2Checkout for sure is one of the best options for accepting payments online today. So if you love 2Checkout like we do, here’s how to set it up in Invoicebus. First thing, of course, is to get a 2Checkout account if you don’t already have one. Once you activate it you need to configure several things to make sure it works properly with Invoicebus. 1) Login to your 2Checkout account, and from the top menu navigate to “Account”, then “Site Management”. 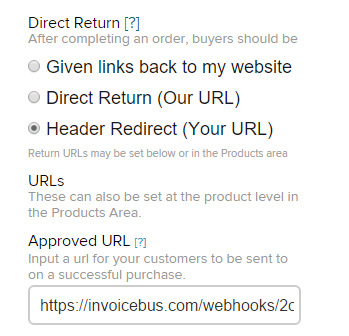 Here in the section “Direct Return” select “Header Return (Your URL)” and in the “Approved URL” text field enter this URL: https://invoicebus.com/webhooks/2checkout/. Be careful to enter it exactly as displayed here, with lower case letters and trailing slash at the end, otherwise the invoice payments process might not work as expected. 2) After you set the return process, you need to set the notification URLs. From the top menu click the “Notifications” button, the circle located on the right. On this page click on the green “Enable All Notifications” link to mark all notification events. In the “Global Settings” section for the “Global URL” enter the same URL from above: https://invoicebus.com/webhooks/2checkout/ and click on the “Apply” button. This will copy the global URL to all notification events text fields. And don’t forget to save the setting at the end. With these notifications, Invoicebus will know if any payments are made to your invoices. 1) To set it up in Invoicebus, the first thing you need to do is enter your 2Checkout “Seller Id” (also known as Account Number) and “Secret Word” in the Invoicebus “Settings” section. If you wonder why we need the “Secret Word”, it’s because we use it to verify whether the payments for your invoices are legit or not. We store all your info encrypted in our database so you can sleep tight when using the 2Checkout payments with Invoicebus. 2) Next thing you need to do is to create (or edit) an invoice where you can enable 2Checkout payments for that invoice. As you already know all payments are enabled per invoice. If you already have connected Stripe than you can choose which payment gateway you’ll use for processing credit card payments for that particular invoice. We’ll even give you the estimated fees charged by 2Checkout just like we do for PayPal and Stripe. After enabling 2Checkout payments for the invoice, a button will be shown to the client invoice preview page, similar to Stripe and PayPal. 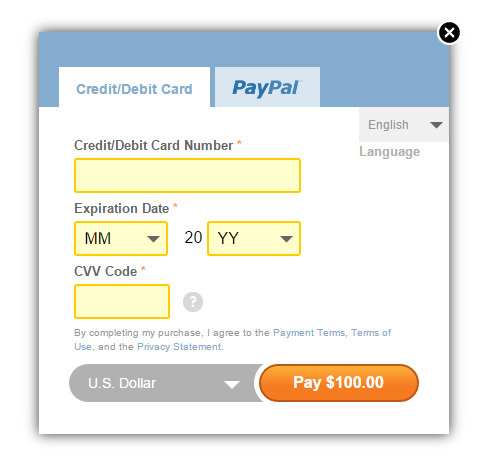 When clicking on “Pay with Credit Card” button, the 2Checkout pop-up will be shown (see image below), where your clients will need to enter their credit card or PayPal details in order to pay the invoice. Note: Due to 2Checkout rules the Inline Form (called Direct Checkout) is shown only if all details for the client are prepopulated in the invoice. Otherwise, the client will be redirected to the standard checkout page where he’ll need to fill out any missing info. If your client address doesn’t have a State/Province then you can exclude that info and enter just “City, Zip, Country”. And if you prefer, you can use a semicolon (;) for separating the “City; State; Zip; Country” and the “Phone; Fax” information. When entering the country we suggest you use the standardized 2-Letter or 3-Letter Country Codes to make sure 2Checkout accepts them properly. Same applies for the states in the USA and the provinces in Canada. 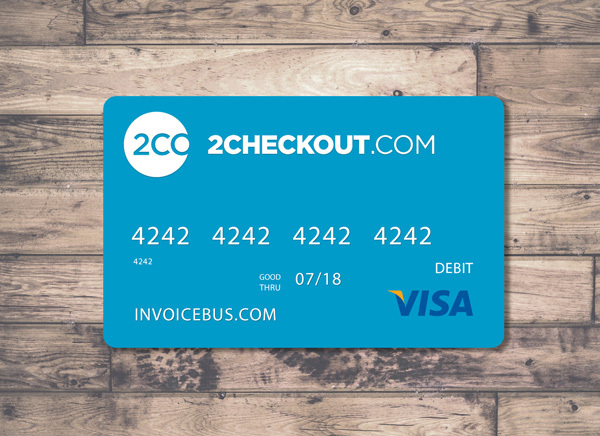 If you need further assistance with setting up 2Checkout payments in Invoicebus, contact our support at support@invoicebus.com. To be honest, I found invoicebus most effect and can use most popular payment gateway. I would like to recommend it. Naz, thanks for the kind words!